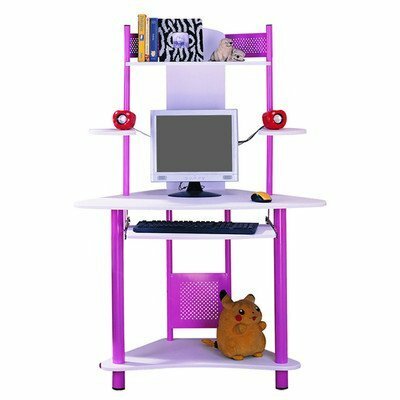 Computer Desk with Keyboard Tray Finish: Pink by InRoom Designs at Indsight. MPN: 2706. Hurry! Limited time offer. Offer valid only while supplies last. 2706 Finish: Pink Features: Top Finish: -Blue. -Pullout keyboard tray. -Metal tube with powder coating. -Top shelf can use to place printer or books. 2706 Finish: Pink Features: Top Finish: -Blue. -Pullout keyboard tray. -Metal tube with powder coating. -Top shelf can use to place printer or books. -Bottom can hold CPU. -2 Shelves to hold speaker. Top Material: -Manufactured wood. Base Material: -Manufactured wood. Dimensions: Overall Height - Top to Bottom: -65". Overall Width - Side to Side: -39". Overall Depth - Front to Back: -24". Overall Product Weight: -61.6 lbs.